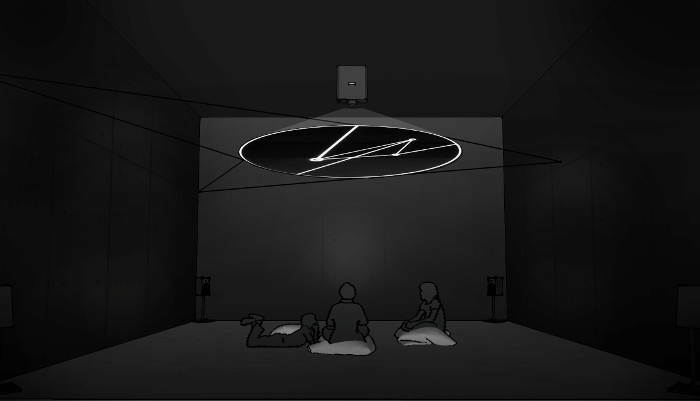 Satellarium is an audiovisual installation generated by the movement of the satellites above the location of the exhibit. The visuals and the sound are based on the real time satellites position taken by an Internet database and processed with programming tools.The disk represents the fragment of the sky visible from the location where the installation is placed and is imagined to be like a virtual hole on the space above the viewers. The satellites are represented like circles, having a precise diameter and thickness based on the magnitude (actual visibility from earth) of the related satellite. The sound is composed to be interactive with the amount and speed of the satellites passing at the same time and is inspired to the real sounds produce by these space artifacts recorded on earth. The connection lines between the orbits forms an ephemeral constellation (polygonal solids) generated by the simultaneous passage of the satellites and constantly changing, representing the hidden astronomic presence of these human made objects in the space.